You have a new baby. You’re sleep deprived. Perhaps you tire of eating every few hours like I did. I want to share some of my favorite nutrient-dense and healthy snacks that make it easier to eat in the joyous and stressful time of a new child. You’ve just built an entire human being, so we want to make sure that you are rebuilding yourself, which is why nutrient-dense is important, not just calories. Blend everything together except the water. Add enough water to reach the consistency you’d like. Get creative but these were some of my usual ingredients. Note: With the addition of the avocado, the shake will turn a brownish depending on how long you let it sit but it is still good. Add dark chocolate chips for some extra sweetness. These are great to have in the freezer to grab for a quick snack. Use whatever nut you would like. These contain a lot of good fats from the coconut oil and nuts. Great for satiety and all the nutrients that come along with good fats. Here’s a cheat sheet on good fats. Print it out and put it on the fridge. 8 eggs in one bread! It’s also lower in sugar than most breads. When women tend to have milk supply issues, blood sugar dysregulation is at the top of the list! Excess grains and sugar are not a new Mom’s friend on many levels – milk supply, sleep, mood, and regaining pre-baby figure. 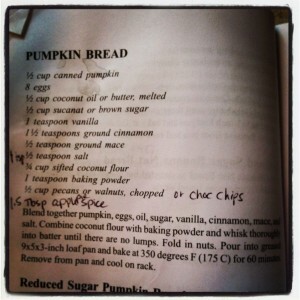 This is from Bruce Fife’s Coconut Flour Cookbook with a few modifications. Super delicious! Add lots of grass-fed, raw butter to the top for fat-soluble vitamins A and K2. Read more on butter here. Many Moms say this is an easier way to eat protein as it’s in bread form – quicker to chew. Wrap a 1/2 slice of bacon around a date (remove pits) and repeat as many times as you want. Bake in the oven at 350 F for approximately 20-25 minutes or until the bacon is done to your liking. If you can find bacon from a pastured pig, even better. Let me hear what foods you found easy when baby arrived? I hope you enjoyed these ideas on healthy snacks to refuel your body!